The Solaris Editors' Blog: More monkey business: Gareth L. Powell has been busy promoting Ack-Ack Macaque! More monkey business: Gareth L. Powell has been busy promoting Ack-Ack Macaque! Gareth recently did a fantastic podcast with The Skiffy & Fanty Show, where he and Jason Sanford discussed the nuances of and differences between British v. American SF. He also recently took part in The Next Big Thing, a round robin meme that has been circulating in the blogosphere. For Gareth’s insights on his inspirations and motivations for Ack-Ack Macaque check out his answers. We’re also excited to announce that Ack-Ack Macaque has been listed in both The Ranting Dragon’s ‘Top 20Most Anticipated Speculative Novels Released in December 2012’ and Tor.com’s ‘Fiction Affliction: “Genre-Benders” for December’. 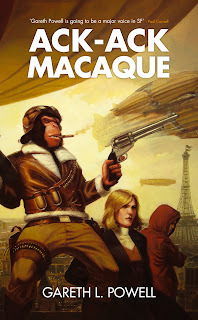 And that's not all - Everything Comes Back to 2000 AD, Geek Syndicate and The BaryonReview are all buzzing about Ack-Ack Macaque’s impending release. And that's even without the love from fans, who've been giving it some great reviews. If you’d like a preview, because you are as excited as we are, then check out the reactions and reviews on Goodreads. On 28th December, don’t miss “20 Minutes with GarethPowell” – a fantastic podcast with the folks at The Roundtable. Also, look out for Gareth in “My Life in Books” at Mass MovementMagazine and for his interview with SFX, both due to appear in December. And, of course, there's the official launch of Ack-Ack Macaque atForbidden Planet next week - with an event at their Shaftesbury Avenue store on Wednesday 12th December, followed by one at their Bristol store on Saturday 15th December! We’d love to see you there! Don’t forget to connect with Gareth and other fans, by liking Ack-Ack Macaque’s Facebookpage and joining the Facebook launch event. If you can’t wait for Ack-Ack Macaque’s official launch, you can pre-order it on Amazon and via Waterstones. How'd ya like THEM bananas, eh? I've read some of the reviews of this book and they've been great. This sounds like it's really interesting and a good read.